The US Ambassador to Bangladesh congratulated the nation on moving forward with genetically modified food crops after viewing a demonstration plot growing pest-resistant Bt brinjal (eggplant). “I’m pleased the [Bangladesh] Ministry of Agriculture and other bodies are working so hard to educate farmers and looking at ways to mitigate this pest, including by expediting registrations of new products – especially biological control products – to help farmers,” said Ambassador Earl R. Miller after seeing plantings of brinjal (eggplant) genetically engineered to resist the destructive fruit and shoot borer pest. 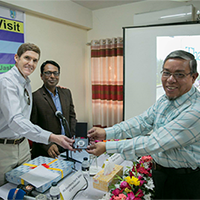 Miller was accompanied by his wife, Michele Adelman, USAID Deputy Mission Director Zeinah Salahi and other USAID officials during their Feb. 11 visit to a Regional Agricultural Research Station (RARS), in Jashore, where they met with Bangladeshi scientists and brinjal farmers. 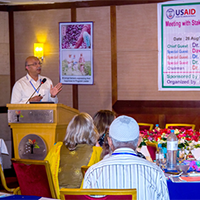 USAID collaborated with the Bangladesh Agricultural Research Institute (BARI) and Cornell University in developing the pest-resistant brinjal under the Feed the Future Bangladesh project. It was the first GM good crop approved for commercial use in South Asia, making Bangladesh a regional pioneer in agricultural innovation. Adelman, a Cornell alumnus, was delighted to see the university’s logo at the research station. The Bangladeshi government approved four Bt brinjal varieties for release in October 2013, and first distributed seeds to 20 farmers in four districts in January 2014. Adoption has increased dramatically since then, with more than 27,000 farmers now growing Bt brinjal across all districts of Bangladesh. A recent BARI study, published in PloS One, confirmed that farmers could earn higher economic margins on Bt brinjal than on conventional varieties, due to reduced insecticide sprays and increased yields. The delegation also toured key USAID agriculture, labor and food assistance programs in Jashore and Khulna, including field trials of GM maize, where the Millers expressed keen interest in the devastating impacts of fall armyworm and the ability of GM maize to resist the pest. Mohammad Abul Hossain is living proof that farmers can reap tremendous benefits from agricultural science. Like most of the approximately 150,000 smallholder farmers in Bangladesh, Hossain grows brinjal, a crop also known as eggplant and aubergine. And like those other farmers, he used to experience tremendous losses due to the fruit and shoot borer, a destructive pest that reduces brinjal yields and cuts into farmer profits. Hossain had tried to fight the pest with insecticides. In Bangladesh, brinjal farmers typically spray insecticides two or three times per week — a rate that can increase to twice per day as harvest nears. Insecticides can account for 40 percent of a farmers’ total production cost, while also inflicting severe impacts on human and environmental health. Worse, they’re often ineffective, leaving farmers with yields reduced by 30 to 60 percent. So when Hossain heard about Bt brinjal, a genetically engineered eggplant variety that is resistant to the fruit and shoot borer, he wanted to learn more. Developed by the Bangladesh Agricultural Research Institute (BARI) in cooperation with Cornell University, USAID and other partners, Bt brinjal is the first genetically engineered crop to be commercially released in Bangladesh. It contains a protein from a common soil bacterium that has been used to fight pests in organic crops around the world for more than 70 years. Though his curiosity was piqued by the 2014 release of Bt brinjal, Hossain decided to hold back for a year and observe its performance in a relative’s field. “Realizing its potential, I contacted BARI, met the officials and collected seed from the research station free of cost,” he recalled. 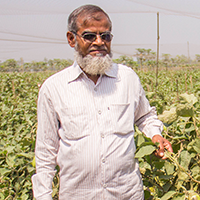 Following the suggestion of BARI scientists, Hossain planted one line of conventional, non-Bt brinjal around his field as a refuge crop to help protect the Bt brinjal from the fruit and shoot borer pest. After his first abundant harvest, he was so impressed that he began sharing what he knew with other farmers in his area. “I have sold about 8,056 kg (17,760 lbs) of Bt brinjal from my land,” Hossain recently told a group of more than 60 local farmers. “There was no [borer] infestation in my crop, and I am expecting to harvest another 400 kg (881 lbs) of brinjal from the field with the same result.” Rather than spraying insecticides on a weekly basis, Hossain applied insecticides just two or three times during the entire season to protect against other insect pests. In six months, Hossain earned about $1,600 growing Bt brinjal on a small piece of land. By comparison, he earned just $275 growing corn in the same field. Given the increased profits and reduced pesticide use, he thinks Bt brinjal will create hope among neighboring farmers who struggle to earn a livelihood from their land. Hossain, 55, has been farming for 15 years, raising vegetables, rice, corn and potatoes on nearly three acres of land. He also tends fruit orchards, a pond for aquaculture and cattle. With a background in business, Hossain is considered a cutting-edge farmer who pays careful attention to production methods and crop diversity. His interest in agriculture is so keen that he encouraged his son to earn an agriculture diploma course in a local institute. Others are now following his example. The number of farmers growing Bt brinjal jumped from just 20 in 2014 to 25,520 by 2018, with more adopting the improved crop each day. Many of them have reported a six-fold increase in their incomes. It is estimated that widespread cultivation of Bt eggplant in Bangladesh will result in a benefit of more than $200 million for the nation’s smallholder farmers. 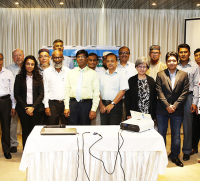 The Feed the Future South Asia Eggplant Improvement Partnership (FTFB) in collaboration with Bangladesh Agricultural Research Institute (BARI) and Sathguru Management Consultants organized a day-long meeting titled “Bt Brinjal Project Progress Review Meeting” at the Six Seasons Hotel, Dhaka on September 13, 2018. FTFBP project management and officials of BARI, USAID-Misson, Department of Agricultural Extension and Bangladesh Agricultural Development Corporation attended the meeting and shared their knowledge and experience of the successful adoption of Bt brinjal during the last three years. 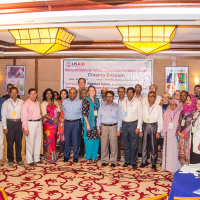 Participants discussed strategies for sustainable adoption of Bt brinjal in Bangladesh. They also discussed the status of Bt brinjal in the Philippines and emphasized the major efforts for commercialization and adoption of the expected varieties. Bt brinjal, Bangladesh’s first genetically engineered food crop, released earlier in 2013, has been successful with an increased adoption to about 33000 farmers in the 2017-2018 season. Studies have shown that farmers received a 6-fold increase in the net returns with no harmful effects of Bt brinjal varieties on non-target organism, allowing the growers to reduce the use of insecticide by 61-98%. BARI has applied for the release of three additional high yielding Bt brinjal varieties suitable to a wider geographic area. The institute has adopted more rigorous stewardship practices to sustain the success of Bt brinjal in the future. The Feed the Future Biotechnology Partnership consortium offers an integrated, demand-driven approach to boost food security and economic growth by introducing and stewarding agricultural biotechnology to food cropping systems in Bangladesh and the Philippines. USAID provided a three-year (2015 – 2018) award under the Feed the Future Biotechnology Partnership to facilitate the late-stage development, deregulation, commercialization and dissemination of Bt brinjal in Bangladesh and Philippines. “Political will, policy support, effective stewardship and communication are key to the successful and sustainable adoption of agricultural biotechnology in developing countries,” said Vijay Paranjape, stewardship coordinator of the Feed the Future South Asia Eggplant Improvement Partnership. Using the example of Bt brinjal in Bangladesh, Paranjape emphasised continuous stewardship and communication programmes in the successful adoption of genetically engineered (GE) Bt brinjal and other GE crops. 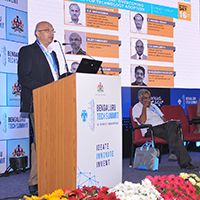 He made his remarks in a panel discussion of the Bangalore Technology Summit 2017 on November 16 that brought together national and international experts, thought leaders, technocrats, researchers, investors and policy makers. “Stewardship and regulatory practices adopted by technology developers need to be made known to all stakeholders and not just the regulators to make the technology durable,” said Paranjape. He also said that farmers in developing countries like Bangladesh who have limited resources need to focus on technological advances for better food production. He also said that field level performance and durability of Bt brinjal will affect the success of Golden Rice, Late Blight Resistant Potato, Bt cotton, Salt Tolerant Rice and other GE crop research and development in Bangladesh. Bt brinjal is the first commercially released genetically engineered food crop in Bangladesh. The field demonstrations conducted from 2014 to 2017 shows the benefits of Bt brinjal in controlling the fruit and shoot borer. Farmers are highly satisfied with their experiences. The crop was initially developed in India but not permitted for commercial cultivation due to strong opposition from NGO and anti-GM activists. Realizing the need for scientific innovation and adoption of modern agricultural technologies for food security, political and agricultural leaders in Bangladesh took the bold step of commercializing Bt brinjal. The Feed the Future South Asia Eggplant Improvement Partnership provides post commercial stewardship and communication support for Bt brinjal in Bangladesh in collaboration with Cornell University and Bangladesh Agriculture Research Institute (BARI), with support from the USAID. Bangladesh is the first country in South Asia to commercialize a genetically modified food crop – Bt eggplant. Bangladesh granted approval for the release of four varieties of Bt eggplant on October 30, 2013. The number of farmers cultivating Bt brinjal in Bangladesh has risen from 20 to 108 to 250 to 5512 from 2014 to 2016 — a clear indication of the benefits of Bt technology in controlling the fruit and shoot borer and growers’ positive experience with the improved varieties. Bangladesh is planning to release other genetically modified crops currently in the advanced stages of research, including Late Blight Resistant Potato and Golden Rice. With agrarian models undergoing a paradigm shift in Bangladesh, it is imperative that researchers, academics, seed production experts, extension professionals as well as farmers are appraised about the effective stewardship of biotech crops both pre- and post-launch as key to sustainable production. 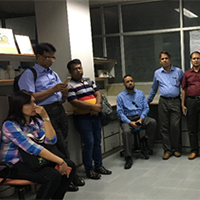 In this regard, a training program on “Stewardship for Biotech Crops” for the researchers of the key biotech projects in Bangladesh was organized under the aegis of Feed the Future Biotechnology Partnership (FtFBP) South Asia Eggplant Improvement Program in partnership with Mahyco at Dawalwadi, Mahyco from September 8–9, 2017. The objective of the training was to expose scientists to the concept of “Excellence through Stewardship” (ETS) as a life cycle approach to product management. Once exposed to the concept, researchers are expected to make conscious efforts toward quality management through structured systems and processes to establish stewardship and maintain quality in each phase of a product’s life cycle. Twenty people associated with the development of the transgenics of these three crops attended the two-day training program, including scientists from the Bangladesh Agricultural Research Institute (BARI), the Bangladesh Rice Research Institute (BRRI), officials from the Bangladesh Agricultural Research Council (BARC) and representative from the Ministry of Agriculture, Bangladesh, as well as Bt brinjal project implementers from the Philippines. The experts oriented participants on the importance of stewardship in maintaining the plant product integrity of genetically modified crops and what aspects needed to be taken care of at each stage of development. The various modules discussed involved: research in the laboratory, breeding for trait introgression in contained facilities, trait testing, quantification and purity, confined field trials, plant and seed multiplication, commercial plant and seed distribution, quality assurance, product launch stewardship and product discontinuation, incidence response management and resistance management. Experts also oriented the participants on Quantitative ELISA and PCR testing kits and the best practices adopted in Insect Resistance Management. The participants also attended the 5th Annual South Asia Biosafety Conference at Bangalore, where they had the opportunity to interact with leading biotech researchers and regulators in South Asia. They had the opportunity to understand the regulatory processes adopted by neighboring nations and the latest advancements in crop biotechnology in the region. During the optional workshop on “Best Practices for Public Sector Genetically Engineered Product Development Programs,” the participants were appraised about the various case-by-case challenges faced by Indian researchers. As an outcome of the program, participants are now encouraged to adopt a stewardship culture across their biotech projects. With all the stakeholders comprehensively appraised about the process, the teams will gear up to identify areas of improvement in the life cycle of their projects. 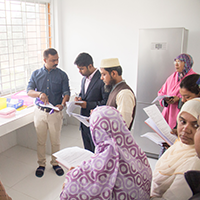 The FtFBP South Asia Eggplant Improvement Program will further guide the researchers in developing a robust and customized stewardship process for strengthening existing quality management systems to achieve and maintain plant product integrity.